The Australian College of Rural and Remote Medicine (ACRRM) have launched their brand-new online education platform, ACRRM Online Learning. The new platform replaces the existing RRMEO system with state-of-the-art, industry-leading software, making it easier for you to access our wide range of education resources. ACRRM Online Learning provides whole-of-career support for Australian medical practitioners. The system is easy to use, continually being reviewed and revised, and will help you to keep up with the demands of the medical profession. 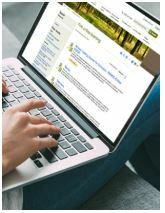 Ease of use: ACRRM Online Learning is built on a contemporary platform inspired by social media, with a fresh simple interface placing everything at your fingertips. Searchable forums: Looking for particular discussion? In ACRRM Online Learning, you have the ability to search discussions to find what you are looking for. Collaboration: In discussions, ACRRM Online Learning makes it easy to add your own content when replying to a topic. Notifications: Customize the way you want to be notified regarding new courses, updates on discussions you have made a comment on, and announcements from ACRRM. Search all available courses on the ACRRM website.